You’re getting married. You. Yeah, that’s right, you. Never thought you’d hear someone say those words, but it’s a crazy world. One thing’s for sure—you’re certainly not going to have some dainty, quaint wedding with a bunch of cheap suits and cheesy music. Instead, what about taking your vows at a gun range in Las Vegas? Now we’re talking. 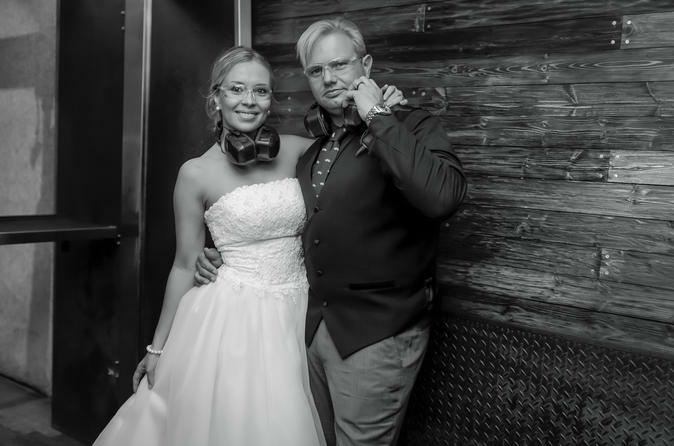 Check out this crazy Vegas wedding package: the bride gets to shoot off a pink M4, the groom handles an MP5, and you both get to shoot the same sweet, deadly little handgun: the Glock 17. The minister, chairs, photographer, pictures, and flowers are all included in this fun Vegas wedding package. Once the deed is done, it’s time to consummate the act by firing off some of the world’s most intriguing guns. Get ready to live out the most fun Las Vegas wedding idea you’ve ever heard. Finally a wedding your best friends won’t complain about attending. While the package only includes shooting for the bride and groom, anyone else can join in for only $110 per person.